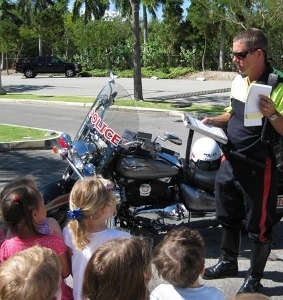 (CNS): George Town neighbourhood cop, PC Emrol Smith, delivered a school safety presentation last week with kids in pre-school section of the Cayman International School in Camana Bay. The office spoke about road safety and safety at home. Not only that PC Smith’s colleague SPC Tim Balls talked to the youngsters about police patrol cars and motorcycles. School staff were said to be delighted with the visit and said that it was a valuable lesson for the youngsters who all had a great time. If you want to find out more about neighbourhood policing in your area contact your local police station. (CNS): Police are now investigating the discovery of what turned out to be a BB gun close to the Clifton Hunter School in Frank Sound on Friday following a report by a member of the public to school security. Disciplinary action has reportedly been taken by the school regarding the students involved but police enquiries are ongoing regarding the recovery of the gun. 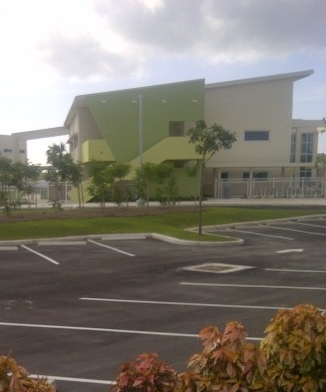 At the start of the school day on Friday, the education ministry said, a report was made by a member of the public to school security that a student was seen just outside the school campus, hiding a suspicious object. The principal and a security guard immediately investigated the report and discovered what appeared to be an air gun, which they took action to secure before calling the police. The school’s community police officer was contacted, who arranged for the appropriate RCIPS units to respond to the incident. The RCIPS then took possession of the BB gun. Following the school’s internal investigation, parents of the students involved were contacted and disciplinary action taken in accordance with the school’s policy, the ministry stated in a release on Tuesday. (CNS): A 22-year-old man was charged in summary court with burglary Tuesday morning and was remanded back in police custody to face further questioning regarding other crimes. The man was arrested in the early hours of Sunday morning after police had received a report at about 1.25am of an attempted break-in at the Bottle Stop liquor store on Walkers Road. When police arrived near the location officers spotted a dark coloured car driving away from the scene. The cops followed the car and stopped it a short distance away when the driver was arrested on suspicion of burglary. A search of the car had revealed several items of what is believed to be stolen property and the man was charged with one count of attempted burglary. Since his court appearance he has been remanded back into police custody to allow further enquiries to be made into other suspected crimes and the recovered property. (CNS): With pressure mounting for government to cut its operational budget, civil service management is looking for more ways to cut the headcount. According to the latest minutes released by the deputy governor’s office from the public servant heads’ weekly meeting with Franz Manderson, the next cuts could come through a process of consolidation. With 13 ministries and portfolios, over 70 departments, 25 statutory authorities and government companies as well as numerous boards, committees and commissions, public sector management believes some functions and responsibilities of these entities may be duplicated, obsolete or misplaced. Project 1 is part of phase IV of the ongoing Public Service Review, which was described at the meeting by the deputy governor’s strategic advisor, Peter Gough, as a rationalization exercise. A team made up of Eric Bush, Dax Basdeo and Alan Jones, with support staff, has now been appointed to strategically review the make-up of the public sector and see where structural adjustments can be made to better serve the needs of the country and reduce public sector costs. A report on the consolidation exercise will be delivered in April, which will contain a draft organizational structure, taking into account the two extra ministries that will be created after the May general election, which will help the governor in the allocation of responsibilities to the new government once it is elected. While the civil service is under pressure to cut cost, the enlarged cabinet with seven elected members, as well as growing expectations for more due diligence in government reducing the operational budget, continues to prove elusive. In order to assist the project team in the consolidation, a request has been made to the Cabinet Office in the UK for an expert in field to help. Despite claims to reduce the civil service, the UDP administration increased public spending every budget since in took office last May and the former premier indicated his position that it was up to the governor’s office and the portfolio to make job cuts in the civil service, not the politicians. However, the civil service has always claimed that it needs political direction on what services to cut before it can reduce head count. 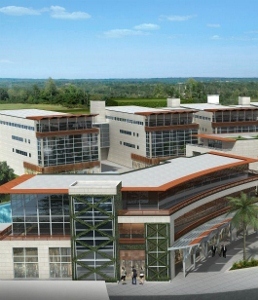 Facing the impasse, Franz Manderson has nevertheless pressed on with efforts to seriously address staff number, which, when government companies are included, still sits at around 5,000. Manderson has revealed his intention to cut at least 360 over the next five years through attrition. On top of the pay freeze and a halt on recruiting civil servants, government is beginning to examine the possible privatization of some government service. Balancing Cayman’s budget will be a major issue for candidates running in the May General Election and so far most candidates feel they can succeed where this current administration has failed to cut costs. However, the cuts required are far deeper than a few savings here and there as cuts need to be made to such a level that Cayman can return a surplus in its budget without increases or creating new taxes. This is likely to prove considerably more difficult for them once in office than it appearsnow on the campaign trail. See the latest minutes from the deputy governor meeting below. (CUC-PFL): Savannah Primary was the day’s biggest winner this past Saturday as they took home the coveted Under 9 Champions Cup and Under 11 Consolation Cup as well as the Most Valuable Player Award for the Under 9s at the 2012/2013 CUC Primary Football League (PFL) finals at the Annex Field. With four finals and two third-placed games being contested, fans were in for a special treat. In the Under 9 Consolation Cup, Bodden Town Primary defeated Prospect Primary 1-0 with Jacoby Tugman scoring the winner. In the Under 9 Champions Cup Third-Placed game, South Sound Schools redeemed themselves with a 1-0 victory over St. Ignatius Prep following a disappointing semi final loss the week before. Aiden Hew grabbed the winner. In the Under 9 Champions Cup Final, Savannah Primary was out for revenge against an undefeated Cayman Prep squad. Earlier in the Playoffs, the boys from Savannah were soundly beaten 6-1 by a rampaging Cayman Prep team. With that defeat etched in their minds, Savannah Primary was determined to not let history repeat itself. Following a scoreless first half, Jawan Wray opened the scoring for Savannah in the 38th minute but almost immediately, Cayman Prep was back on level terms as Joshua Small found the back of the net in the 40th minute. With the score locked at one-a-piece at the full time whistle, both teams prepared themselves for extra time and possible penalties. Savannah’s Jeremy Scott made sure that penalties would not decide this final as he slotted home the winner in the 53rd minute much to the delight of the Savannah faithful. At the sound of the final whistle to end extra time, the Savannah contingent went wild and ran to embrace their young heroes and heroine. They had done the impossible. To add to their trophy haul, Savannah’s substitute goalkeeper Nicholas Franca was awarded the Gerome Graham Memorial Award as the game’s Most Valuable Player for his heroics between the posts. Young Mr. Franca was exceptional making some key, instinctive saves throughout the game. 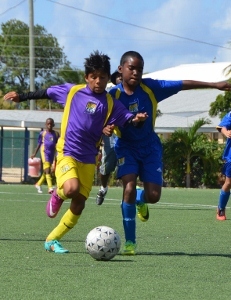 In the Under 11 Consolation Cup Final, it was Savannah Primary’s second opportunity to grab a title as they faced Cayman International School. With the score locked at 1-1 following extra time, with Jawan Wray grabbing the lone goal forSavannah and Francisco Magno responding for Cayman International School, it was on to penalties. Savannah’s penalty takers were precise as Jawan Wray, Arnold Berry and Jeremy Scott buried their respective penalties. Cayman International was not so fortunate as only Jonathan Rado was able to find the back of the net as Savannah Primary ran out 4-2 winners. In the Under 11 Champions Cup Third-Placed game, Sir John A. Cumber Primary defeated St. Ignatius Prep 3-0 thanks to goals from Demonte Seymour, Barry Dre Tibbetts and Marc Parchman. In the Under 11 Champions Cup Final, it was up to Cayman Prep’s seniors to grab a piece of glory and the last silverware of the day and they did not disappoint. A goal just before halftime from Aaron Jarvis and a ‘rocket’ from David Pitcairn in the second half was enough to see off Red Bay Primary. For his excellent play, young Mr. Pitcairn was awarded the Justin Henry Memorial Award as the game’s Most Valuable Player. It was certainly a day for the history books. Savannah’s double victory in the Under 9 and Under 11 divisions was the first silverware in football for the school in a very long time. Cayman Prep’s Under 11 undefeated season was exceptional, considering the high quality of opposition they faced throughout the regular season and the Playoffs. The PFL Committee thanks Progressive Distributors and Gatorade for their continued support of the PFL as well as the many teachers, parents and spectators who cheer on their players week in and week out. Thanks to all the volunteer referees including Lovine “Pillo” Jovan and Gonzalo McLaughlin. Special thanks to Dwayne Ebanks whose persistence in ensuring games during the regular season and Playoffs were properly officiated significantly added to the success of this PFL season. In addition, he spent many Playoff days organizing and guiding the young trainee referees and assistant referees. (CRFU): The Queensgate Pigs Trotters are top of the league at the halfway stage of the 2013 DART Alex Alexander Memorial Championship, following Saturday's hard fought 17-0 victory over the John Doak Iguanas. However, the Advance Fire Buccaneers have now also played themselves into championship contention after smashing the Century 21 Storm 55-6. Storm have suffered a nightmare campaign so far, with three league defeats in a row in addition to their defeat in the Heineken Charity Shield. They are missing key players through injury and there was more bad news for them on Saturday when Howard McLaughlin, celebrating his 40th birthday on the day, was ruled out with a knee injury sustained in the warm up. Nevertheless, the Storm made an encouraging start to the 2pm game. Despite problems elsewhere on the pitch, their pack remains a formidable force. The rucking of barrel-chested captain Jacob MacAdam, ably assisted by the feisty Allain Forget, produced a penalty which was expertly despatched by Josh Brown. However, after that it was one-way traffic as the Buccaneers took control and blew the Storm away. With Jon and Paul Murphy showing such telepathic understanding that one thought that they might be twins, not just brothers, the Buccaneers ran in try after try. Captain Dan Bond led his troops forward and was ably assisted in the task by the lithe Richard Adams and the youthful exuberance of Ron Arscott. The Storm's injury problems mounted when Keswick Wright left the field with a strained finger. The final score of 55-6 reflected the Buccaneers' dominance and they will go into the second half of the season buoyed by this thumping win. The top of the table clash between the Pigs and the Iguanas kicked off at 4pm. With flaxen-haired captain Doug Anderson and flanker and ex-professional boxer John Killian returning after rib injuries, and veteran Paul "No knees" Parker back on the bench, the Pigs pack had an energetic feel about it. This was reflected in a penalty won through good work by the little and large combination of the slimline Dan Florek and the gargantuan Connan Hill. The Pigs' Number 10 Marco du Plessis brought his shooting boots along this week, unlike previous weeks, and he converted the penalty for a 3-0 lead. As the half drew to a close, led by the kicking of Chris Bunce and the driving runs of Marcus Cumber the Iguanas exerted sustained pressure on the Pigs try line. However, the Pigs defence was fanatical, with players such as Paul Westin, David Acutt and Alistair Lum recklessly throwing their bodies into danger in the manner of crazed Japanese kamikaze pilots. This ensured that the half-time score remained 3-0 to the Pigs. The second half was another war of attrition, but as the Iguanas tired, the Pigs backs showcased their attacking rhythm. James Waters used his height and size advantage to break through and set up a try for Iain Currie to finish in the corner. Again, the Iguanas pushed for a try and spent a sustained period of time near the Pigs try line. However, again the determined defensive work of players such as the tenacious Neil Montgomery and the irrepressible Sam Anderson ensured that the Pigs achieved a rare shut out. Du Plessis kicked three more penalties in the second half, veteran Graham Thomson displayed his renowned turn of pace and the match ended in a 17-0 win for the jubilant Pigs players. 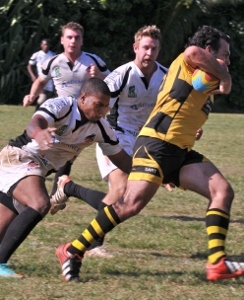 Whilst games are televised online on www.caymanrugbytv.com games can bewatched (at no charge) in South Sound at the Cayman Rugby Football Club and spectators will not be disappointed with ample fast, hard hitting action! (BBC): Chief constables in England and Wales will have to declare all gifts and hospitality on a public register under new anti-corruption measures. The move is part of a package of measures aimed at rooting out police corruption and misconduct announced by Home Secretary Theresa May. All officers will have to declare any second jobs they do. The Independent Police Complaints Commission (IPCC) will also be expanded to investigate all serious complaints. And there will also be a national register of officers who have been struck off in a bid to stop dismissed officers being recruited by other forces. The move came on the day officers from Operation Elveden – the Metropolitan Police investigation into alleged corrupt payments to public officials – made their 60th arrest. (CNS): A 9-year-old boy died in hospital yesterday after being found unconscious in a swimming pool in George Town on Sunday 10 February, police have confirmed. 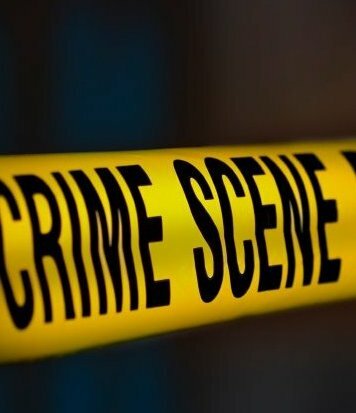 The child, who is believed to have drowned, was taken to the Cayman Islands Hospital on Sunday afternoon at around 3:15pm after he was found in the pool at an apartment complex off Walkers Road. He was treated at the hospital but he passed away on Monday 11 February, a spokesperson for the RCIPS said Tuesday afternoon. The police are Investigating the incident but the police spokesperson added that, at this stage, there did not appear to be any suspicious circumstances surrounding the child’s death. (CIASA): The CIASA Masters Swim Programme at the Lions Aquatic Centre is coached by Mike Barrowman, a Caymanian who is also a former competitive swimmer, Olympic champion and world record-holder. Now in its 13th year, the CIASA Masters’ program has had nearly 4000 participants since it started. It takes place on Monday and Thursday evenings from 6-7pm at the Lions Pool, costs only CI$5.00 per session and has earned a reputation as being an efficient, yet relaxed and welcoming training environment. With an average of four swimmers per lane there is plenty of space; and each week three separate workouts are written for three differing tiers of ability. shape; as well as for those who are training for the popular sea swims and triathlons. years until it was finally broken by Kosuke Kitajima of Japan.